Claire and Jamie return to Scotland as Outlander starts to move the plot towards the endgame of the failure to save the Jacobites from being decimated at Culloden. Sometimes you don’t know that something is necessary until it actually happens and that is exactly the case with the return to Scotland for this show. It was interesting to play around with the French setting and all of the characters that brings but at its core this show feels most at home in the Highlands of Scotland. I also believe that the journey to France was a necessary one and I did enjoy the visual break from the relative simplicity of the Highlands setting but there’s a warmth to everything in Scotland in this show and I suspect that this is exactly the point. There was also a degree of suspension of disbelief with the characters in France as they were given tasks to do that were somewhat outside their skill-set. Jamie’s a smart man but the political manoeuvring he had to do between Prince Charles and all of the other players in this revolution didn’t quite suit him. It was all believably written and well acted but something felt off about it. Similarly Claire suddenly thrust into the role of being lady of a rich house didn’t quite suit her either. Interestingly I didn’t actually realise these things until I watched this episode and noticed that this setting is much more appropriate for these characters. 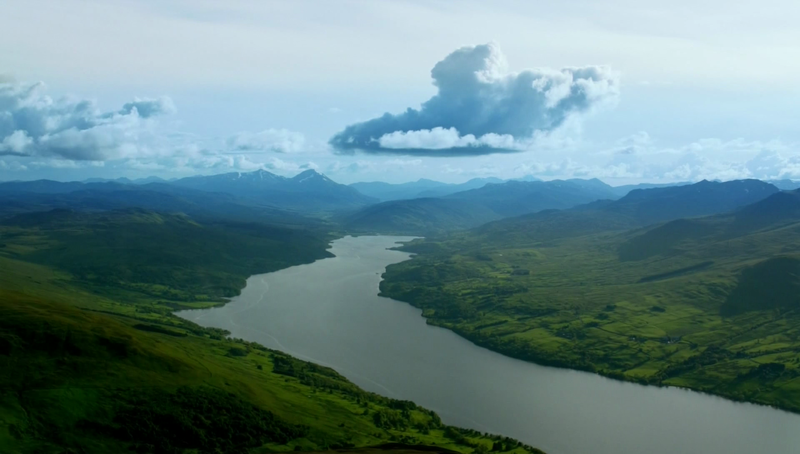 The return to Scotland is immediately put forward as if it were a profound triumph as shown by the scenic views and the playing of the theme song of this show as we are reminded how beautiful and welcoming Scotland is. We are thrust right back into life at Lallybroch and quickly learn that some time has passed since Jamie and Claire returned. Jenny has had another child and the potato crop has grown. It all seems nice and happy which extends to Jamie and Claire who seem to be in reasonably high spirits after the emotional gut-punch they both received last week. The time skip proves necessary for the show to not dwell on this and allow things to move forward. Dealing with the loss of their child hasn’t been entirely forgotten about and I don’t imagine it ever will but it is sitting in the background. It is treated as something in the past that has some distance personified by the literal distance between Scotland and France. There are still lingering effects such as Jamie being unable to sleep and getting up in the middle of the night but there are also signs of healing shown by him talking softly to Jenny’s baby in his native tongue. It’s a sweet moment that shows both pain and hope in a really subtle way. The whole scene is drowning in emotion without making it overt and it sticks out in the mind by virtue of how real it feels. 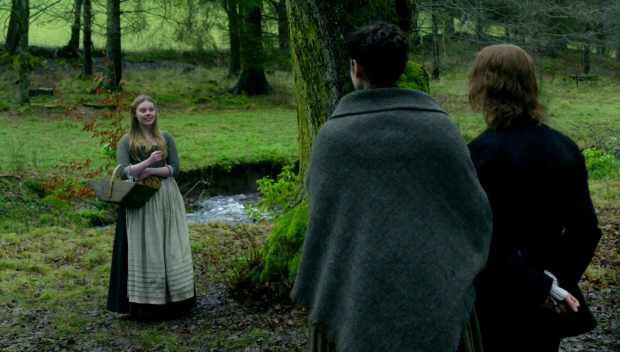 Claire and Jenny have an equally touching moment where they bond over their shared motherhood as they look on at Jamie bonding with Jenny’s baby. Claire is able to remember what it was like to talk to her unborn child where Jamie never got to experience that. It’s really bittersweet but Jamie now gets to experience something like it and can be completely honest about how he feels in a way that he can’t with anyone else. Jenny’s words “It’s a comfort to the soul” resonate powerfully. In true Outlander tradition happiness never lasts long without some complication appearing. It turns out that Prince Charles has made major steps forward in starting his rebellion and has forged Jamie’s signature to indicate his support. It would seem that he did too good a job of playing the part of being on his side. This is a problem as it puts Jamie’s name on a list of people who will be deemed traitors to the Crown which definitely isn’t a good situation to be in. It puts Jamie, Claire and everyone in their family at risk of being singled out by the legitimate Government so something really needs to be done about it. It’s pretty clear that the rebellion is happening whether they want it to or not so the plan shifts to attempting to win the War rather than stop it. This means that they need more muscle so Jamie will have to convince his spiteful Grandsire Lord Lovat (Clive Russell) to lend his forces to the War effort. On the other side of this is Colum MacKenzie who would like Lovat to remain neutral as he plans to. It’s a fairly simple two sided argument with an equally simple objective for Jamie but I feel that the episode gets far too bogged down in the detail of the situation to the point that these scenes become uninteresting. I did find the sordid past of the Fraser Clan to be compelling but not enough time is spent on it to make it feel as important as it needed to be. Clive Russell is an engaging presence and an effective counter to Gary Lewis’ Colum. The two men have some really fun debates and are both really strong characters but the political detail is far less interesting than the characters. I think the focus should have been on why the characters have a particular belief rather than the belief itself as I found myself tuning out during the political double talk. The real intrigue here was Jamie’s family relationships and how he could use what he knows about them to make them come around to his way of thinking but, as I’ve said, the episode focuses too heavily on the detail. Never bring politics to the dinner table! There is room for some fun despite this as Claire plays up the belief people have in her being a Witch by having a “vision” of the future as a way to convince Lovat to lend his support lest he suffer execution. Caitriona Balfe does a great job playing Claire doing the role of the White Witch with full theatricality. Sam Heughan’s passionate monologue punctuated by throwing his drink on the fire to really sell his position is great as well. It’s a remarkable step up from Claire’s performance in the previous episode and it works really well in context. 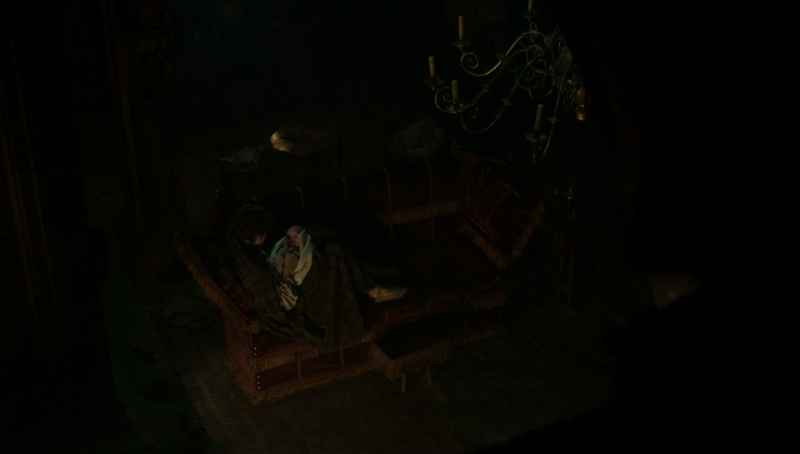 It’s interesting that the falseness of the supernatural gives Claire and Jamie the very real power of manipulation as they take advantage of the fear and ignorance of the time period to steer events in the direction they want. We know that their efforts will ultimately fail but so far Outlander is doing an excellent job of making the journey towards that failure an interesting one. This episode promotes a sense of hope that the Jacobites can actually win the conflict even though we know that isn’t the case. The important thing is that the characters believe they have a chance even though they are marching closer to failure with everything they do. As all of this is happening, Loaghaire makes her return despite nobody actually wanting that to happen. My belief is that her role in this show was over after the part she played in Claire’s Witch trial. She seems to have seen the error of her ways and begs Claire for forgiveness but something about it felt out of place. A lot of it has to do with the fact that Loaghaire has never felt fully formed as a character and this episode does nothing to correct this. Her one defining feature is that she is obsessed with Jamie and no attempt is made to add depth to this. She does have her use in the ongoing political discussions but it could have been achieved some other way. From Claire’s perspective this is handled in an interesting way. The way she lays on the anger she feels as she describes the thoughts she has had to punish Laoghaire and that there is no way that she could forgive what was done. It’s really cruel but not altogether undeserved in all honesty. 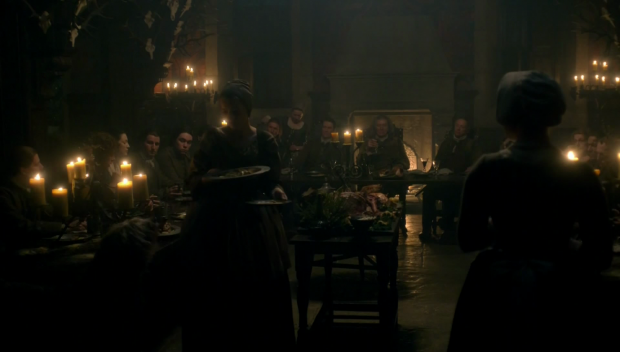 There’s the suggesting that she is simply making Laoghaire stew for a while as she asks Jamie to thank her. I doubt this is the end of Laoghaire’s role in this show and I’m not all that thrilled about that prospect. A solid episode that returns the focus of the show to Scotland and feels completely right in doing so. It’s interesting to find out the sordid past of Jamie’s family but the episode gets far too bogged down in the politics of the situation rather than making everything character driven. Seeing Claire go full White Witch again is always fun though. 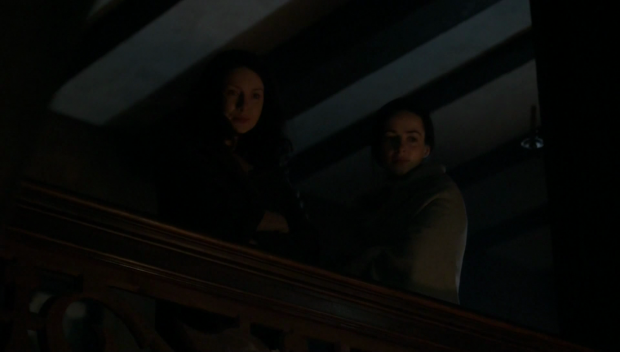 Laoghaire’s return is less than welcomed as well but seeing Claire’s reaction to that is somewhat interesting.